Transitioning back to rural New England from the streets of San Diego takes time and reflection. Westport Island is a great place to learn how to be still, muse on life, and listen to the grass grow. Westport Island is my dewdrop. Westport Island was settled in the 1700’s. 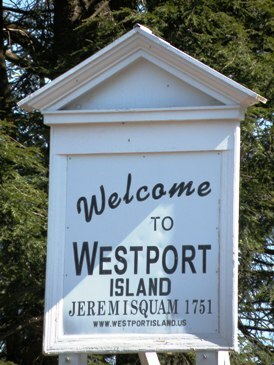 Originally part of the town of Edgecomb (Freetown) and known as Jeremisquam, Westport was incorporated as a separate town in 1828. Island history includes colonization dating to the 1600’s, and a role in the Revolutionary War, the War of 1812, and the Civil War. There are more than 70 cemeteries dotting the Island and numerous private structures with historical significance. The history is a source of pride, and an attraction for geneaologists and historic preservationists. 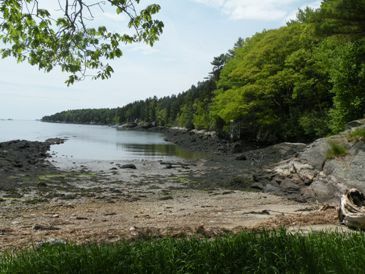 Westport Island is accessible via a bridge opened in 1972 connecting to the Town of Wiscasset. It’s an 11-mile island, covering an area of approximately 8.81 square miles, surrounded by the Sheepscot and Back Rivers. It is a self-contained neighborhood of sorts, because there is little reason for those who do not live or summer on the Island to visit. There are few walk-in businesses. There are no schools, hospitals, grocery stores, offices, or chain stores. For the most part, development has let the Island be. State Highway Rte. 144, the main road, snakes along the rocky spine of the island. Trees border much of the road, giving only occasional hints of the tidal rivers and coves that give the Island its natural beauty. The road itself, as the only ingress and egress to the Island, can be a hot topic among residents. The summer of 2012 paving made it a non-topic for awhile, but Maine winters are hard on roads. Before 2012, the main road was described as "deplorable" and "a hazard to health and safety&quot. It’s better now, but it’s a road best traveled with caution. As a “dead end” without views of the island’s surrounding waters, the Main Road effectively contributes to the quiet and serenity — even when State Rte. 1 is brimming with non-stop summer traffic and noise just a few miles away. Being off the beaten track makes the Island a home for those who value privacy and for those who want to be a part of a small community with qualities of a simpler time. Beyond its historical attractions — the Lobster Co-op, a handful of hiking preserves, the Historic Squire Tarbox Inn, and the Ferry Landing (public boat ramp) are the most common reasons for visitors to venture onto the Island. ****This is awesome!! Keep up the good work! Just reviewed your blog and found it very enjoyable. The 11th Annual Westport Island Shore Run Road Race – “Maine’s Best Little 10K Road Race” – takes place this year on Sunday, August 16, 2015, beginning at 9:00 a.m. The 10K road race on bridge-accessible Westport Island takes place on a USATF-certified course through scenic pine and fir tree forests and over two bridges spanning inlets to Heal Cove and Montsweag Bay. The race is to benefit the Westport Island Volunteer Fire Department, whose members directed traffic and provided logistical support at the race. Over the last ten years, the race has generated over $15,000.00 in proceeds for the Volunteer Fire Department!! Last year, $1,400.00 was raised for the firefighters. For more information and to register online for this year’s race, go to http://www.westportisland.org. Race day registration will take place beginning at 7:30am at the Old Town Hall on the Main Road, Westport Island. In last year’s race, Megan Hempstead of Jamaica Plain, Massachusetts, won first place female overall; Chase Huges of Westport Island, Maine won first place male overall. Our wonderful 2014 sponsors included: Maine Yankee; Hodgdon Yacht Services; Ames True Value Supply on Route 1; Sheepscot River Marine Service; Abbott, Incorporated; Wiscasset Ford; Newcastle Chrysler Dodge Jeep; Bath Savings Bank; Norm’s Used Cars and Trucks; Sharon Drake Real Estate of Bath; the Hampton Inn of Bath; Road ID; Westport Island Community Association; and the First Federal Savings Bank. The 11th Annual Westport Island Shore Run 10K Road Race coincides with the 60th Anniversary Celebration of the Westport Island Community Association, which takes place after the race on Sunday August 16th, 2015 in the afternoon beginning at 2pm, at the Old Town Hall and Community Church on the Main Road. There will be an exhibit of community arts and crafts in the Old Town Hall and a musical and audio revue of local talent in the Community Church followed by a champagne and appetizer reception at the Town Hall. As relative newcomers to Westport Island we have found your blog to be a wonderful intro to our new community. Thank you. Is there somewhere I can find postings for community events on the Island? Unfortunately I usually learn about them after they have come and gone.